Target Summer Clearance 90% off?? I have heard from a couple of people that the summer items at Target have gone to 90% off. I have also heard from several people that items are still 70% off at their store. So, there is a good chance if you store is still at 70% off today the 90% off markdown will happen tomorrow (Wednesday). Check out the photo above of all the items Melanie was able to pick up at 90% off. I am amazed her store had so much left. She got a kiddie pool for $1.29, horseshoes and bocce ball for $1.99 each, pool inflatables for $.39, kids hooded towels $1.49, outdoor string lights $1.00, tablecloth $.99, and some outdoor toys for $.49! Make sure you keep your eyes open for these 3 packs of sunscreen, they are ringing up at 90% off too. Thanks Melanie and Nicky for photos and Erica & Lindsey for head up on sunblock deal! WHOA! Didnt even think of checking out the grill section this AM. I was there did great with summer clearance lots of great stuff for a bday party coming up, but did not think about the grill section! Does anybody know if the same sale is in Florida too? 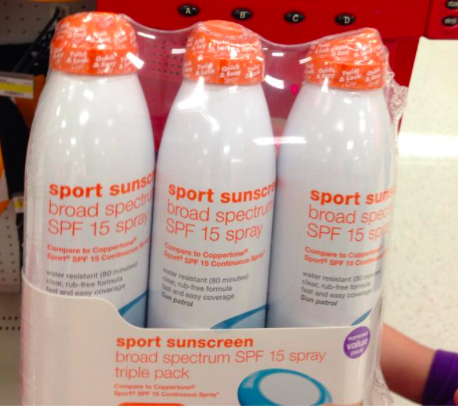 I bought the three pack sunscreen. It rang up 1.39 plus used 5% cartwheel and 1.00 off coupon so made them almost free. I bought 4 of them. The sunscreen is also buy 3, get one free. I used the cartwheel offer as well. Summer items are still ringing up full price where I am at. They only have some summer items in the clearance section. Those are ringing up 90% off. There is also the limited edition beach bag ringing in at $0.99. Only hot pink color found in women’s and beach bag section. They are heavy duty, pink stripes and plastic pockets on each side. Someone also posted about the Cool Gear EZ-freeze bpa free water bottle found in the ziplock bag section earlier. They are two sizes, both with blue lids and clear bottoms for $0.59 and $0.79. Great find thanks for the heads up. I also went and found beach towels today for 90% off. Thanks everyone for your help.